Of Course Boomers Had Driveways! At the turn of the nineteenth century, the Industrial Revolution was underway and the country was shifting from an agrarian economy to one based on manufacturing. Populations shifted from farms to cities and as immigrants came in, these cities grew. Housing was quickly built to accommodate the influx of workers that would signal the nation’s progress up until the Great Depression. Since the automobile was a new invention, it was purchased by upper class citizens who could afford it, so working class people in working class houses had no need for driveways. In fact, only about a third of city dwellers owned their own homes at that time. Many boomers — especially early boomers — will recall living in this type of urban housing. Henry Ford tried to change all that by producing a car he felt everyone could afford. To make sure his workers could afford it themselves, he instituted a $5 a day wage that was unheard of at the time. Of course, that wage was not granted equally among his employees, but that is a matter for another time. The spread of the Model T into the 1920s initiated the first working class houses built in cities, with personal driveways attached. The wealthy always had driveways, though not in the sense that boomers might recall. For centuries, the driveway up to the manor was an important path, intended to impress and reveal the occupants’ status, education and wealth. The end of the driveway was usually a circle from which visitors and owners could be dropped off at the front door. The carriage and horse were then stowed in the stables away from the main house. Driveways in rural communities were most often dirt or gravel, and were more for moving farm equipment than the family car — which was most often a pickup truck, as soon as they became available in the 1920s. Barns and sheds housed the equipment necessary for the main job, so any auto or truck was going to reside outside on or near the driveway. The rise of the driveway slowly continued as new housing was built before World War II; a new status symbol for a generation that grew up riding streetcars and city buses, a driveway indicated a certain level of modernity and upward mobility in a rising middle class. It was in this era where the driveway was treated as part of the house’s landscape; instead of a concrete slab, it was composed of two strips separated at a wide enough distance for a car’s wheels to tread, with a grass median between the concrete. It was after the War that the driveway really came into its own. Returning soldiers got married and started families, which signaled the dawn of the Boomer Generation. Housing was an immediate concern, but cities were crowded, with little or no land for these new families. New suburbs were the answer, where land was readily available and inexpensive, or at least affordable with GI veteran assistance programs. Since a worker’s commute was now a serious concern, the fathers of boomers making the move to the suburbs had to own a car. Virtually all of the houses built in the late 1940s and into the ’50s featured a place for the family car, as a “standard feature.” Some driveways led to a garage behind the house, but most stopped at the back end of the house. In just two generations, the evolution of the driveway had come from a centuries-old symbol of “to the manor born” to one of middle class, utilitarian car-parking slab. At this point, the vast majority of families owned one car. For boomers growing up in these houses, the driveway was empty all day since their fathers took the car to work, so it became a boomer play space. Girls might draw hopscotch games in chalk on the family driveway, while boys were rolling homemade go-karts up and down. Many boomers (including Mister Boomer) recall flipping hula hoops up and down the driveway, or roller skating — with metal skates — back and forth. Driveways became personal and an integral part of the house, as was the family car parked on it. In the early days in Mister Boomer’s neighborhood, less than a third of homes had garages, where a driveway extended to the garage positioned in the yard behind the house. As the 1960s pushed on, several of his neighbors had single-car garages built, all the more to leave the driveway empty. That space was soon needed as boomers grew and got cars of their own. For Mister Boomer in his mid-boomer era, it was practically a rite of passage to acquire a car shortly after getting a drivers’ license. Driveways would have to serve for parking at least two cars; at one point in Mister Boomers’ house, there were three cars for household members, two of which resided in the driveway. With no garage, it was a constant shuffle to move vehicles so that one or the other could exit. While we often consider certain television programs, toys, fashions or music as defining symbols of the Boomer Generation, Mister Boomer humbly submits that the driveway was an important part of the culture that molded our generation. What memories do you have of your families’ driveways, boomers? 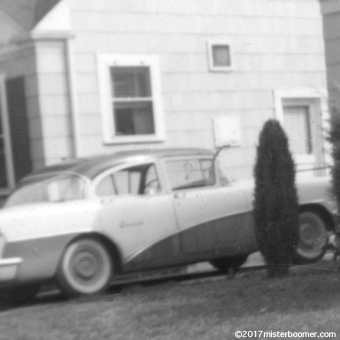 Author Mister BPosted on June 25, 2017 Categories Cars, Pop Culture History, SuburbiaTags 1950s, 1960s, 1970s, boomer generation, Cars, driveways, nostalgia, pop culture, Suburbia1 Comment on Of Course Boomers Had Driveways! Yes, we are old enough to remember when air conditioning first began to be popular in new cars. Boomers lived directly in the path of the changeover from fountain pen to ballpoint pen and on to disposable pen. Legend has it placing a “lucky penny” in a shoe was derived from the practice of putting a penny in a bride’s shoe on her wedding day to give the couple good luck and wealth. The penny loafer became a big deal for early boomers when Ivy League students began wearing them with their khakis. Going to the movies was a real event for Baby Boomers. Movies and matinees and drive-ins … oh my! Keep coming back to misterboomer.com each week for a look back at the way we were, how we grew, and who we became because of it all. Subscribe to the RSS feed and get notification whenever a new post is published. And, tell all your friends and neighbors to drop in through the Facebook link, too! Thank you for five memory-packed years!